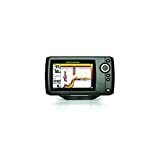 The Humminbird 409590-1 HELIX 5 Fish Finder is a good item if compared to its features and pros. However, some users were not satisfied with the product because it had no internal GPS unit. This means that you have to buy an external one and connect it to your fish and depth finder. Humminbird has come up with yet a new product, the Humminbird 409590-1 HELIX 5 Fish Finder. It is an excellent product and is even suitable for use by beginners and amateurs. Its user-friendly features will force you to buy it to enjoy fishing. The machine features the UniMap Cartography which covers the full U.S Coastline with full information on their depths etc. The standard resolution for this UniMap is 30 meters per pixel, which is enough. Therefore, you can have a clear and vivid view of the radar along with the map at all times. The machine also has other noticeable features mentioned below. The HELIX 5 fish finder has an upgradeable software which means that now you can easily upgrade your software of your unit. Upgrades are often necessary because the weather conditions and other fishing conditions keep on changing from time to time. Therefore, you can easily upgrade your software online. Go to the My Humminbird section of the company’s official website, get your product registered and you can have the software updated in no time. This feature is yet another reason for its popularity. This is why it was rated 4 out of 5 stars. Are you not having a nice income from fishing? Is your fish finder outdated? Is its sonar system not up to the mark? If yes then the HELIX 5 with the Dual-beam Sonar is the perfect solution to these problems. The HELIX 5 features this amazing sonar technology which means that now you have two beams of sonar i.e. narrow and wider one. The narrow beam can be used for precise searches while the wider beam is helpful in covering a large search area. So what are you waiting for? Immediately purchase your HELIX 5 unit. Similarly, the display was not high defined which means that you cannot see the device properly in harsh sunlight. However, this defect was removed in higher models of the machine. Other than that, this affordable does not have many defects and it is nearly worth what demanded. It is a perfect device for beginners so do buy it if you want to have a nice fishing experience.